Ever considered doing a Triathlon? Swim, bike and run clinics, plus a practice triathlon are all part of the Try Triathlon Series. 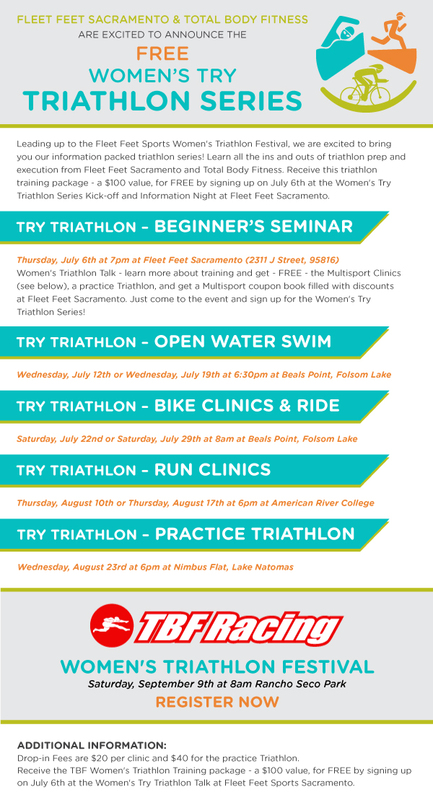 Attend the July 6th Kick-off & Info Night at Fleet Feet Sacramento, 7pm and get the entire series of clinics for FREE! Otherwise, the clinics are available for a fee on a drop-in basis. If you wish to "drop-in" on any clinics, please email Mark Shaw at mark@totalbodyfitness.com for details.